After contacting numerous brokers with no response, I came upon Jim Ross at Just Catamarans. He was friendly, professional and gave us the time of day. We couldn’t buy our boat yet because we were waiting for our business to sell. He kept in contact with us. Upon selling our business we called Jim and said that I wanted to come to Ft. Lauderdale to look at a boat we were interested in. We were ready. Not only did he show me the boat we were interested in, but several others. He explained things to me and was very patient. We have never owned a boat so he had his work cut out for him. After many discussions with my husband, we were going to keep looking. Jim kept in contact and sent us anything new on the market. After hurricane Irma, there just wasn’t that much out there that we liked. I sent him several emails asking questions about costs, etc. He was always quick to respond. At the beginning of May, an Ocean Cat 49 had just been listed. This was the one. We called Jim and asked him to put in an offer. He did it immediately. They countered, we countered and we had our boat in one day. Now I was terrified. What do we do now? He walked us through everything. He gave us names of a few surveyors. He met us in 10 days for the survey in Annapolis, MD. He gave us contact information for several people in the area and if he didn’t know he found out for us. He had the Documentation people contact us to get the ball rolling. We closed in about a month. Jim is a great guy. He still calls or texts to make sure everything is going well. 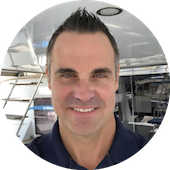 We would definitely recommend Jim Ross if you want excellent service when purchasing your boat.